AAPL remains a key stock-market bellwether even if it has acted weaker than most of the other institutional favorites since the bull market ended in early October. As such, we should on the alert for the unexpected — in this case an upthrust exceeding the two external peaks shown. I mentioned the higher of the two (162.11) here earlier, suggesting that you treat with skepticism any rally failing to exceed it. I’m certainly not expecting this, but that’s all the more reason to be prepared for it, since it could be telegraphing the start of a strong rally in the broad averages. I’ve set a chart alert there, and so should you. _______ UPDATE (Jan 29, 9:23 p.m.): Exactly as we’d anticipated, the stock has exploded in after-hours trading, on the non-news that earnings have “stabilized.” The so far high at 164.85 easily exceeded my bullish benchmark. Now let’s see how far DaBoyz can take this hoax. ________ UPDATE (Jan 30, 7:01 p.m.): The hoax sputtered out, at least for the time being, at 166.15. It’s time to move the goal posts again on bulls, the better to determine whether they are willing to put their money where their mouths are. 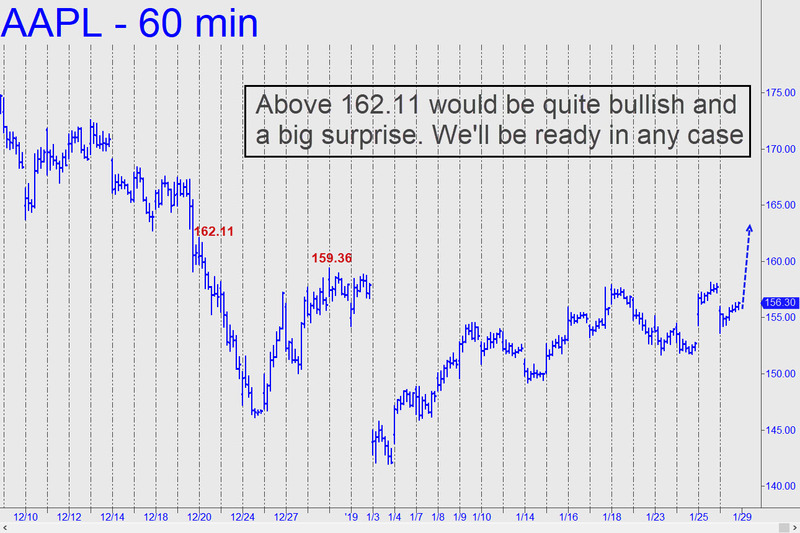 This chart benchmarks a small ‘external’ peak at 168.35 as the one to beat. ______ UPDATE (Jan 31, 5:35 p.m.): A round of applause for DaBoyz, who managed to push this cinder block to 169.00 today, putting bears who remain short in real jeopardy. The mood has changed, and this could be the best chance AAPL’s institutional sponsors will have in 2019 to fool buyers into thinking the stock is going somewhere. We’ll sit back and enjoy the show wherever it goes, taking positions on either side of the market when the odds look juicy.